Florence: the pulsing heart of the Renaissance, period when art and culture flourished after the “Dark Age”. In the XV century Dante, Petrarch and Macchiavelli lived in Florence, while artists like Botticelli, Michelangelo and Donatello created their masterpieces! The city has Roman origins: 59 B. C. is the foundation date. In the VI century the Lombards conquered it and Florence became an independent city-state. One of the most powerful cities in Italy and one of the biggest trade centres in the XIII century thanks to the associations of artisans and merchants which ruled the city and then to the Florentine Republic. When the Medici, a wealthy family of bankers, raised in power, for over three centuries the noble governed the whole of Tuscany making Florence the cultural and intellectual heart of Europe. And now to the modern turist who ventures in the medieval alleys besides the staendhal syndrome what to advice? But also to enjoy some of the finest restaurant in the world! Enoteca Pinchiorri (Via Ghibellina 87, tel, 055-242777) is often described as the best of Italy and certainly it has the best supplied cellar in Europe! Situated on the ground floor of a fifteenth century building, it has a type of cooking that is a mix of Tuscan and French tradition. Jacket and tie are part of the dress code you have to observe! La Taverna del Bronzino (Via delle Ruote, 27r. 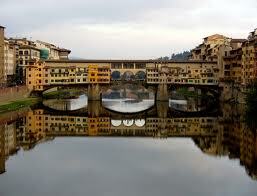 Tel.055-495220) takes its name from the Florentine painter, with an excellent wine list. Alle murate (Via Ghibellina, 52r. Tel. 055-240618) animated by a female “chef “and a touch of the exotic. Try one of the house desserts! Buca dell’orafo (Volta de’ Girolami, 28r. Tel. 055-213619). The buca dell’orafo is a beloved tavern for real Florentines. Home made cooking, fresh pasta with a menu that varies from day to day. Try the “ribollita”, a soup made with red cabbage, on Saturday! Palle d’Oro (Via Sant’Antonino, 43r. Tel. 055-288383). This trattoria is simple but the beefsteak “alla fiorentina” is rare! This entry was posted on Friday, August 24th, 2012 at 9:38 am	and is filed under Italian Recipes and Food. You can follow any responses to this entry through the RSS 2.0 feed. You can leave a response, or trackback from your own site.